They are great in sauces, soups, chowders, rice dishes, and casseroles. To rehydrate, soak desired amount in hot water or add directly to recipes that will cook for at least 20 minutes. 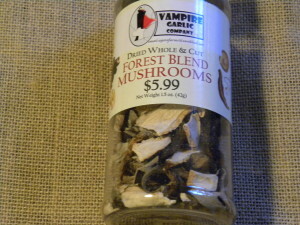 1 oz of dried mushrooms will reconstitute to 3-4 oz. Stored in a tight container in a cool, dark area, they will last a year.